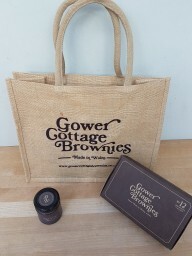 Blondie Gift Set, Gower Cottage Blondies, Blondie Butter and a Jute "Bite Me!" Bag. 3 Month Chocolate Brownie variety subscription. 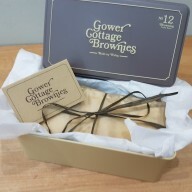 Send / Receive a different flavour box of brownies each month for 6 months. 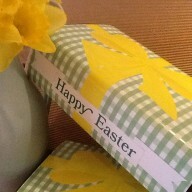 Select your first delivery date, and after that we will schedule on or close to that date for another 2 more deliveries. Gower Cottage Blondies, home baked by Kate, regular chocolate with no nuts. Raspberry Ripple Gower Cottage Brownies, home baked by Kate, regular chocolate with no nuts.